When I am in the exhibit hall working on the Southern 1401 locomotive, there is one question that is always asked: “How did you get it in here?” Some people think the Museum must have been constructed around it, but no, the building was not built around it. Here is the story of the heaviest object in the Smithsonian and how it was installed in the National Museum of American History. The Southern Railway No. 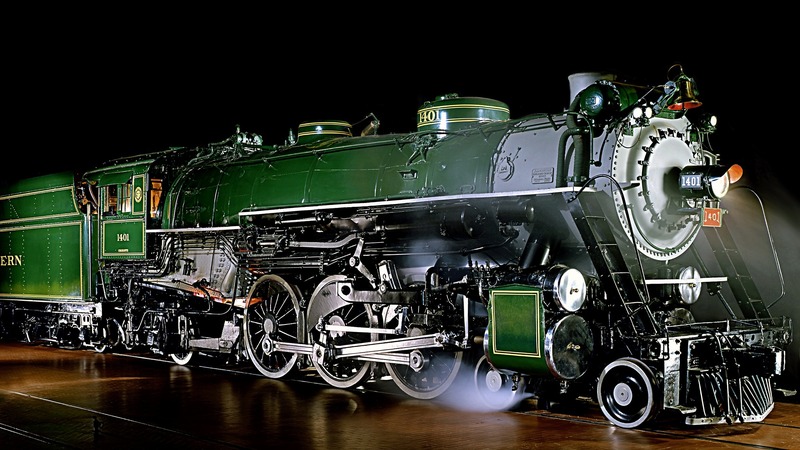 1401 locomotive, built in 1926, was first identified in the 1950s by then-curator John H. White as a good representative of steam in the earlier part of 20th-century rail transportation. 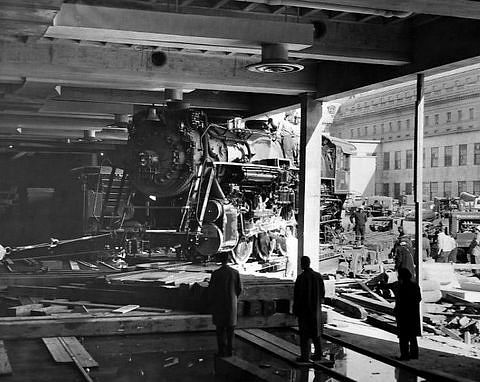 Construction of a new museum, then called the National Museum of History and Technology, presented the opportunity to collect and display the locomotive. 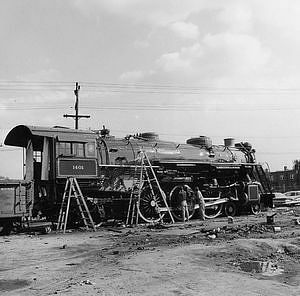 The locomotive, donated to the museum by the Southern Railway Company, was restored in Alexandria, Virginia. Workers gave the driving wheels a final polish before the 1401 was towed to the Navy Yard in Washington, D.C., on November 2, 1961. 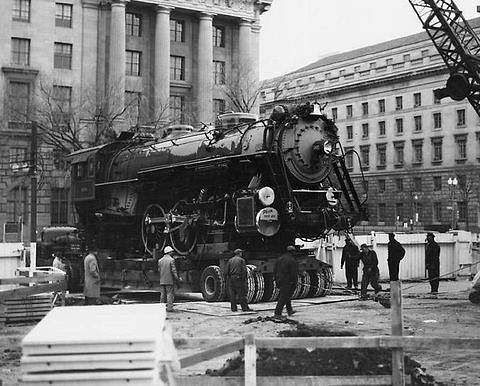 The locomotive was transferred from rails at the Navy Yard onto a 250-ton-capacity flatbed trailer. Utility personnel and Museum staff negotiated the route through the city to the Museum, ensuring that electric, water, telephone, gas, and street rail equipment was not jeopardized. A Locomotive in a City Street? 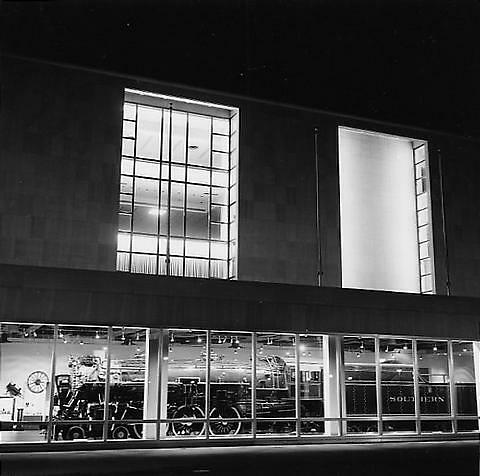 At 10 in the evening of November 25, 1961, the locomotive was on its way to the Museum. 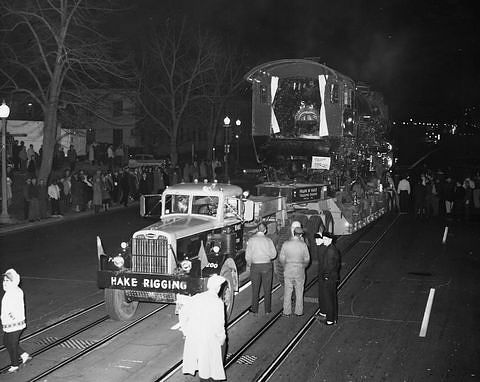 Many people lined the streets to watch the locomotive pass slowly along its route. Occasionally, workers needed to bridge the utilities below the street with large metal plates. In this picture you can see the railway tracks in the street and onlookers watching from the curb as the crew helps to negotiate its path. The last mile was a 27.5-hour journey. The locomotive arrived at 7:30 a.m., November 26, 1961. Curator John White describes: "All had gone well to this point but in coming up over the curb onto the museum grounds one of the rear axles of the trailer snapped. The locomotive rocked back and forth. For an instant I thought it might go over on its side, but it did not. We managed to jockey the rig off of the street. There it sat until the next day when repairs could be made." The final day, November 30, 1961. The locomotive was transfered from the flatbed onto a temporary track and turntable that had been assembled by Southern Railway. The locomotive was eased slowly through the window opening. The turntable was slowly pulled around to align over the tracks in the exhibit hall. 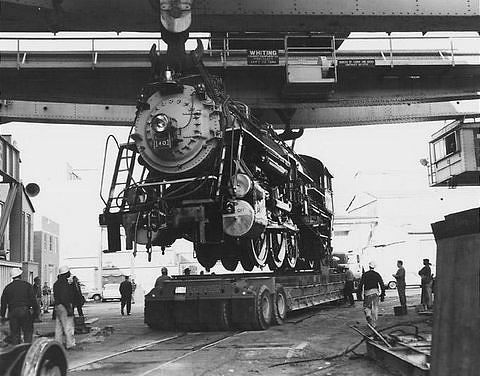 The locomotive was then raised, the turntable removed and the locomotive lowered onto its tracks. 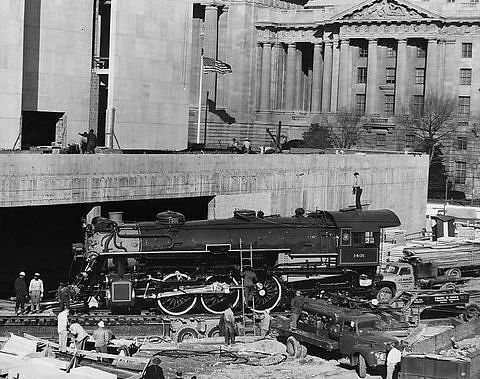 It took 11 days to move the locomotive into the Museum, where it became the focal point of the Railroad Hall exhibit. But that is not the last time it was moved. The locomotive was backed up 15 feet to reposition it for the new transportation exhibit, America on the Move.